Trigeminal neuralgia (TN) is the 5 th cranial nerve disorder, which results in unbearable facial pain in patients. ,, Radiosurgery is one of the treatment options for TN. , Radiosurgery for TN is a very unique procedure as the TN target is the smallest of all known radio surgical targets. Hence, it requires a high degree of precision and accuracy while targeting with a radiosurgical unit. Gamma Knife is one such radiosurgical unit, which is being used traditionally to treat TN. ,, Gamma Knife radiosurgery is an invasive frame based procedure. However, due to technical advancements in precise targeting, linear accelerator based radiosurgery, and robotic radiosurgery are employed to treat the Trigeminal nerve target as a noninvasive frameless procedure. ,,,,, CyberKnife (Accuray, Sunnyvale, USA) is a robotic radiosurgery unit which is used to treat both intracranial and extracranial lesions stereotactically. Since TN is the smallest radiosurgical target, the smallest collimator size available in the respective radiosurgical units is used to treat it. In CyberKnife 5 mm collimator is preferred for treating TN while 4 mm is preferred in Gamma Knife. Though, this small collimator sizes are giving reasonable dose distributions in the treatment planning systems, the dosimetric accuracy of such a small radiosurgical fields may not be guaranteed due to the following reasons. According to Pantelis et al.,  a diode detector overestimates the output factor of 5 mm collimator of CyberKnife by 5% while a pinpoint ionization chamber underestimates it by 10%. CyberKnife output factor studies by Rah et al.,  also shows inaccuracies with the diode and ionization chamber detectors. The diode and ionization chamber detectors are the detectors, which are used traditionally for the relative beam data measurements in classical linear accelerators. Since, these detectors are showing uncertainties in output factor measurement of CyberKnife small beams, other non-conventional detectors such as gel dosimeter  and glass rod detector , were used to find out the CyberKnife output factors. Though, there are reasons explained by researchers for the inaccuracy in the measurement of output factors, it is an issue with the small collimators and it is predominant for the smallest 5 mm collimator than the other collimator sizes in CyberKnife. ,,,, Studies by Yu et al.,  states that, those uncertainties in output factor measurement increases with a decrease in the collimator size. The dose linearity with monitor unit (MU) is poorer for 5 mm collimator than all other 11 collimator sizes available in CyberKnife. Since, there is a probable dosimetric inaccuracy with 5 mm collimator; the accurate dose delivery with the 5 mm collimator would be a challenge especially for very tiny targets like the nerve target of TN. Average volume of a TN target is about 40 mm 3 . The thickness of the nerve target is about 2 mm and the length is about 6 mm. Because of such small dimensions of the nerve target 5 mm collimator is preferred in CyberKnife. However, the immediately next collimator size of 7.5 mm, which is having less dosimetric uncertainty than the 5 mm collimator may perhaps be a choice for the CyberKnife treatment of TN. There are evidences available in the literature for selecting larger collimator sizes. Fraioli et al. used 10 mm collimator in a dedicated linear accelerator and Kanner et al. used concentric 4 mm and 8 mm collimators in Gamma Knife. Similarly, Smith et al. used 5 mm and 7.5 mm collimators in a dedicated linear accelerator set up to treat TN. Dose distribution with 7.5 mm collimator should be analyzed before considering it for the treatment of TN. In the present study, an attempt is made to find out the role of 7.5 mm collimator in the CyberKnife treatment plans of TN. Randomly selected 11 TN patients were taken for this retrospective study. Multiplan treatment planning system (Accuray, Sunnyvale, USA) was used to generate the CyberKnife radiosurgery treatment plans. The nerve target and the organs at risks (OARs) were delineated in computed tomography images (1 mm slice thickness) after fusing with the special magnetic imaging sequence called T2 drive. The initial treatment plans were generated and executed with 5 mm collimators. The prescribed dose was 60 Gy in a single fraction to the nerve target. Usually, this 60 Gy is prescribed to 75-85% isodose with respect to the maximum point dose. The maximum point dose to the brain stem was a constraint dose of 40 Gy. Retrospectively, the treatment plans for 7.5 mm collimator were generated by keeping the same optimization goals. However, the optimization was rerun. In a similar way, treatment plans were generated with 5 mm and 7.5 mm bi-collimator system as well. The target doses were analyzed and compared for volume doses, dose conformity, and homogeneity. In the target volume doses, D 98% , D 90% , D 75% , D 50% , D 30% , and D 10% were taken for the analysis. Conformity index was calculated using the Paddick  and Nakamura et al.,  formula. Conformity Index = (V RI × TV)/(TV RI ) 2 , where V RI is the overall volume receiving the prescription dose, TV is the Trigeminal nerve target volume, and TV RI is the target volume, which receives the prescription dose. Homogeneity index was calculated using the following formula. Homogeneity index = D max /D RI ,  where D max is the maximum point dose, D RI is the prescription dose. P values were calculated using the two tailed Student's T test and tabulated. The dose spillage outside the target was calculated instead of the organ specific doses except the maximum doses of the brainstem. Brain stem is the critical OAR, which is in closer vicinity to the trigeminal nerve target. Hence, brainstem is the OAR, which is prone to get very high dose when compared to all other OARs drawn for the CyberKnife treatment planning of TN. Keeping this in mind the brain stem dose and the dose to soft-tissue, which is surrounding the nerve target, were also analyzed in this study. In brainstem the maximum dose was estimated by using the volume dose indices D 1% , D 2% and the maximum point dose. The dose indices D 5% and D 10% were also taken for analysis. Dose to the normal tissue, which is surrounding the nerve target, was analyzed in terms of the dose volumes V 100% , V 90% , V 75% , V 50% , V 25% , and V 10% . Here, V 100% indicates the overall volume excluding the target, which receives the prescription dose of 60 Gy. 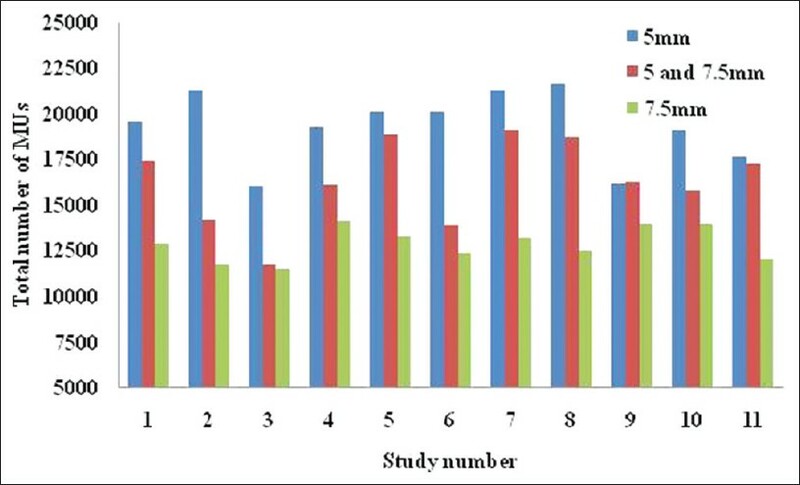 The treatment parameters, such as the number of beams, number of nodes, and the total number of MUs were also compared between the treatment plans. Nodes are the virtual points in space where the robot places the miniature linear accelerator for different beam orientations. Several nodes constitute a path. For TN, a dedicated treatment path is available in CyberKnife radiosurgery. The mean volume of the trigeminal nerve target was 36.9 ± 3.4 mm 3 . The mean prescription volume, which is nothing but the V100% was 71.7 ± 7.8% volume of the nerve target. Dose distribution comparison between the treatment plans by 5 mm collimator, 5 mm and 7.5 mm collimators and 7.5 mm collimator for a sample case is shown in [Figure 1]. As far as the target dose coverage is concerned, all the three plans were yielding similar results. The mean value of the D 98% was 48.8 ± 3.8 Gy, 50.1 ± 4.0 Gy, and 49.7 ± 3.9 Gy respectively for 5 mm collimator plan, 5 mm and 7.5 mm collimators plan and 7.5 mm collimator plan. Similarly, D 10% values were 72.1 ± 2.1 Gy, 70.4 ± 2.6 Gy and 69.1 ± 2.9 Gy respectively for 5 mm, 5 mm and 7.5 mm, 7.5 mm collimator plans. 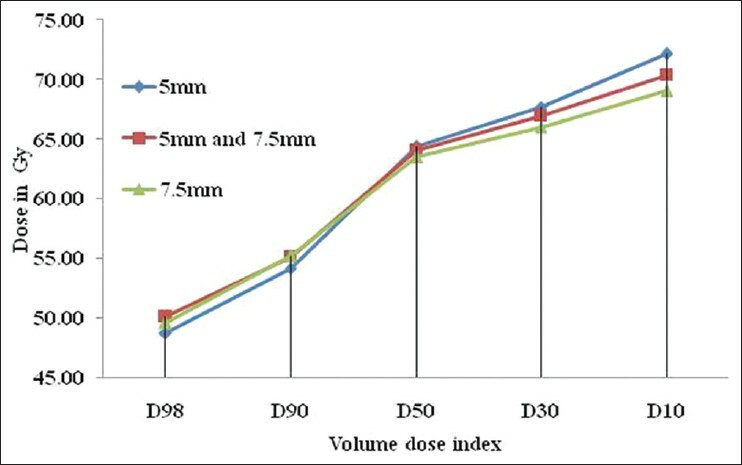 The graph between the volume dose index and the target doses are shown in [Figure 2]. The maximum, minimum and the mean target doses along with the conformity index and homogeneity index are given in [Table 1]. The conformity index for the 5 mm plan is found to be the smallest when compared to the other two plans. The mean conformity indices were 2.31 ± 0.52, 2.40 ± 0.87 and 2.82 ± 0.51 for 5 mm, 5 mm and 7.5 mm, 7.5 mm collimator plans respectively. However, the 7.5 mm plan is more homogeneous than the other two plans. The mean values of D 1% of the brain stem were 10.1 ± 2.4 Gy, 10.4 ± 2.2 Gy and 10.6 ± 2.1 Gy for 5 mm, 5 mm and 7.5 mm, 7.5 mm collimator plans respectively. Similarly, the maximum point doses were 37.4 ± 2.2 Gy, 38.1 ± 5.1 Gy and 38.8 ± 5.5 Gy for 5 mm, 5mm and 7.5 mm, 7.5 mm collimator plans respectively. The graph between the brainstem volume dose index and the corresponding brainstem dose is plotted in [Figure 3]. The dose spillage outside the target was considerably higher for the 7.5 mm plan than the other two plans. Specifically, the 6 Gy volume (V 10% ) was 15.2cc for 7.5 mm plan while it was 11.3cc for 5 mm and 7.5 mm plan and 9.9cc for 5 mm plan. 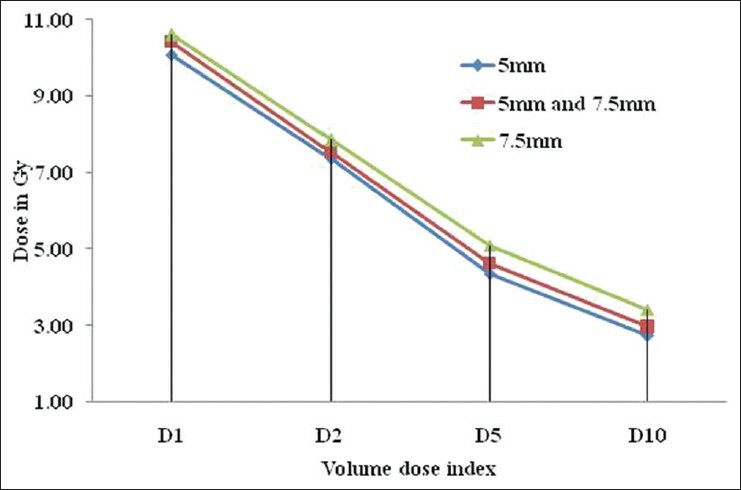 The graph between the dose volume index and the soft-tissue volume is shown in [Figure 4]. As far as the treatment parameters (Number of beams, Nodes and MU) are concerned the 7.5 mm collimator plan was yielding the lesser values than 5 mm collimator plan and the 5 mm and 7.5 mm collimator plan. 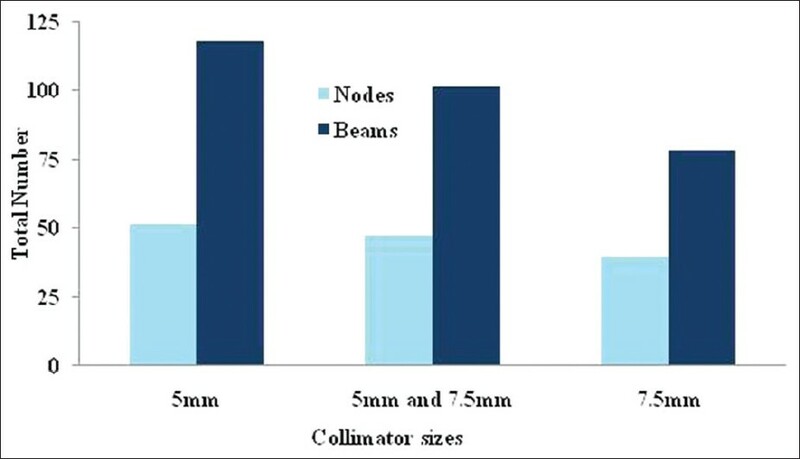 The comparison between the collimator plans in terms of the number of nodes and beams are shown in [Figure 5]. The total numbers of MUs for all the 11 cases in all the three collimator plans are compared in [Figure 6]. From the results, it is noticeable that the target dose coverage is almost the same in all the three plans. However, the maximum brain stem doses are higher for the 7.5 mm collimator plans than the bi-collimator (5 mm and 7.5 mm) plans and 5 mm collimators. Dose spillage outside the target including the brainstem is again higher for the 7.5 mm collimator plans. This dose spillage is a major drawback with the 7.5 mm collimator. This is a critical point as these higher doses are delivered in a single fraction. Specifically, the 6 Gy volumes in 7.5 mm collimator plans are about 1.53 times higher than 5 mm collimator plans and about 1.34 times higher than the bi-collimator plans. 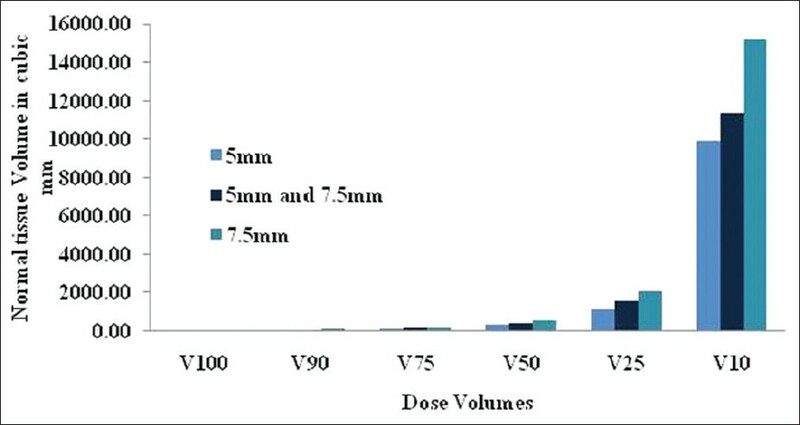 Similarly, the dose volume V 50% (volume receiving 30 Gy dose) is 3.3cc, 4.1cc, and 5.3 cc respectively for 5 mm collimator plan, 5 mm and 7.5 mm collimators plan, and 7.5 mm collimator plan. This shows the degree of dose spillage in 7.5 mm collimator plans than the other two plans. On the other hand, the bi-collimator plans are yielding results in between the 7.5 mm collimator plans and 5 mm collimator plans. As far as the dose spillage is concerned, these bi-collimator plans are also poorer than the 5 mm collimator plans. Furthermore, restriction or addition of 7.5 mm collimators or 5 mm collimators in the bi-collimator system is not in the hands of the planner. From the present study, it is evident that the treatment parameters are having the least values for the 7.5 mm collimator. The number of beams and nodes are about 1.28 and 1.51 times higher for 5 mm collimator plans than the 7.5 mm collimators. Similarly, the bi-collimator plans are about 1.18 and 1.29 times higher than the 7.5 mm collimator plans. This reduction of treatment parameters encourages the fact of faster treatment delivery. In bi-collimator plans the mixing ratio of 5 mm beams and 7.5 mm beams is not consistent. Though this bi-collimator plan is better than the 7.5 mm collimator, they are not showing any superiority over 5 mm collimator plans. According to Flickinger et al.,  increased treatment volume in TN may result in complications. Ma et al. emphasize the same while comparing the linear accelerator based radiosurgery and Gamma knife radiosurgery for TN. Based on this clinical fact, 7.5 mm collimator can be avoided in radiosurgical plans of TN as it irradiates more normal tissue than 5 mm collimators though it can yield lower treatment time parameters. The TN nerve target dose coverage with 7.5 mm collimator is similar to that of the bi-collimator plans and 5 mm collimator plans. Brainstem doses are slightly higher for the 7.5 mm collimator. The bi-collimator plans are also inferior to 5 mm collimator plans in this respect. The treatment parameters are lower for 7.5 mm collimator plan than the other two plans. However, the normal tissue irradiated by 7.5 mm collimator is much higher than 5 mm collimator and 5 mm and 7.5 mm bi-collimator plans. Since the volume of irradiated normal tissue is critical in radiosurgery of TN, the role of 7.5 mm collimator in CyberKnife radiosurgery for TN can be ruled out. 1. Lee KH. Facial pain: Trigeminal neuralgia. Ann Acad Med Singapore 1993;22:193-6. 2. Krafft RM. Trigeminal neuralgia. Am Fam Physician 2008;77:1291-6. 3. Agrawal SM, Kambalimath DH. Trigeminal neuralgia involving supraorbital and infraorbital nerves. Natl J Maxillofac Surg 2010;1:179-82. 4. Gorgulho A. Radiation mechanisms of pain control in classical trigeminal neuralgia. Surg Neurol Int 2012;3:S17-25. 5. Brisman R. Trigeminal neuralgia: Radiosurgery before microvascular decompression. World Neurosurg 2012;78:69-70. 6. Yen CP, Schlesinger D, Sheehan JP. Gamma Knife® radiosurgery for trigeminal neuralgia. Expert Rev Med Devices 2011;8:709-21. 7. Squire SE, Chan MD, Furr RM, Lowell DA, Tatter SB, Ellis TL, et al. Gamma knife radiosurgery in the treatment of tumor-related facial pain. Stereotact Funct Neurosurg 2012;90:145-50. 8. Chao ST, Thakkar VV, Barnett GH, Vogelbaum MA, Angelov L, Weil RJ, et al. Prospective study of the short-term adverse effects of gamma knife radiosurgery. Technol Cancer Res Treat 2012;11:117-22. 9. Dos Santos MA, Pérez de Salcedo JB, Gutiérrez Diaz JA, Nagore G, Calvo FA, Samblás J, et al. Outcome for patients with essential trigeminal neuralgia treated with linear accelerator stereotactic radiosurgery. Stereotact Funct Neurosurg 2011;89:220-5. 10. Fraioli MF, Strigari L, Fraioli C, Lecce M, Lisciani D. Preliminary results of 45 patients with trigeminal neuralgia treated with radiosurgery compared to hypofractionated stereotactic radiotherapy, using a dedicated linear accelerator. J Clin Neurosci 2012;19:1401-3. 11. Zahra H, Teh BS, Paulino AC, Yoshor D, Trask T, Baskin D, et al. Stereotactic radiosurgery for trigeminal neuralgia utilizing the BrainLAB Novalis system. Technol Cancer Res Treat 2009;8:407-12. 12. Tang CT, Chang SD, Tseng KY, Liu MY, Ju DT. CyberKnife stereotactic radiosurgical rhizotomy for refractory trigeminal neuralgia. J Clin Neurosci 2011;18:1449-53. 13. Gerbi BJ, Higgins PD, Cho KH, Hall WA. Linac-based stereotactic radiosurgery for treatment of trigeminal neuralgia. J Appl Clin Med Phys 2004;5:80-92. 14. Sudahar H, Kurup PG, Murali V, Velmurugan J. Dosimetric analysis of trigeminal nerve, brain stem doses in CyberKnife radiosurgery of trigeminal neuralgia. J Med Phys 2012;37:124-8. 15. Pantelis E, Antypas C, Petrokokkinos L, Karaiskos P, Papagiannis P, Kozicki M, et al. Dosimetric characterization of CyberKnife radiosurgical photon beams using polymer gels. Med Phys 2008;35:2312-20. 16. Rah JE, Shin DO, Jang JS, Kim MC, Yoon SC, Suh TS. Application of a glass rod detector for the output factor measurement in the CyberKnife. Appl Radiat Isot 2008;66:1980-5. 17. Perks J, Gao M, Smith V, Skubic S, Goetsch S. Glass rod detectors for small field, stereotactic radiosurgery dosimetric audit. Med Phys 2005;32:726-32. 18. Yu C, Jozsef G, Apuzzo ML, Petrovich Z. Measurements of the relative output factors for CyberKnife collimators. Neurosurgery 2004;54:157-61. 19. Wilcox EE, Daskalov GM. Evaluation of GAFCHROMIC EBT film for Cyberknife dosimetry. Med Phys 2007;34:1967-74. 20. Francescon P, Kilby W, Satariano N, Cora S. Monte Carlo simulated correction factors for machine specific reference field dose calibration and output factor measurement using fixed and iris collimators on the CyberKnife system. Phys Med Biol 2012;57:3741-58. 21. Sudahar H, Kurup PG, Murali V, Velmurugan J. Dose linearity and monitor unit stability of a G4 type cyberknife robotic stereotactic radiosurgery system. J Med Phys 2012;37:4-7. 22. Kanner AA, Neyman G, Suh JH, Weinhous MS, Lee SY, Barnett GH. Gamma knife radiosurgery for trigeminal neuralgia: Comparing the use of a 4-mm versus concentric 4- and 8-mm collimators. Stereotact Funct Neurosurg 2004;82:49-57. 23. Smith ZA, De Salles AA, Frighetto L, Goss B, Lee SP, Selch M, et al. Dedicated linear accelerator radiosurgery for the treatment of trigeminal neuralgia. J Neurosurg 2003;99:511-6. 24. Paddick I. A simple scoring ratio to index the conformity of radiosurgical treatment plans. Technical note. J Neurosurg 2000;93 Suppl 3:219-22. 25. Nakamura JL, Verhey LJ, Smith V, Petti PL, Lamborn KR, Larson DA, et al. Dose conformity of gamma knife radiosurgery and risk factors for complications. Int J Radiat Oncol Biol Phys 2001;51:1313-9. 26. Shaw E, Kline R, Gillin M, Souhami L, Hirschfeld A, Dinapoli R, et al. Radiation Therapy Oncology Group: Radiosurgery quality assurance guidelines. Int J Radiat Oncol Biol Phys 1993;27:1231-9. 27. Flickinger JC, Pollock BE, Kondziolka D, Phuong LK, Foote RL, Stafford SL, et al. Does increased nerve length within the treatment volume improve trigeminal neuralgia radiosurgery? A prospective double-blind, randomized study. Int J Radiat Oncol Biol Phys 2001;51:449-54. 28. Ma L, Kwok Y, Chin LS, Yu C, Regine WF. Comparative analyses of linac and Gamma Knife radiosurgery for trigeminal neuralgia treatments. Phys Med Biol 2005;50:5217-27.